The present study provided a comprehensive description regarding the application of a mixture of three nonliving classes of algae as a promising and inexpensive biosorbent for removing toxic nickel (Ni(II)) ions from the aqueous medium. The biosorption process was tested by varying several experimental parameters such as pH (2–8), contaminant concentration (20–300 mg/L), biosorbent content (0.2–2 g/100 mL), and temperature (20–40 °C). In addition, the competition effects of the presence of Pb(II), Cu(II), and Zn(II) ions on the Ni(II) removal efficiency was studied by varying their concentrations from 30 to 40 mg/L. The microscopic analysis of algae demonstrated that the used biosorbent consisted mainly of Chrysophyta (80%), Chlorophyte (14%), and Cyanophyta (6%). 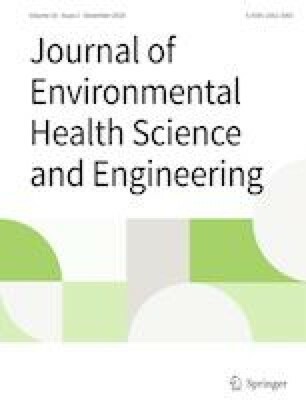 Results demonstrated that these environmental parameters influenced the removal efficiency with a different degree and there was no stable effects rank at conditions under examination. FT-IR and SEM analysis revealed that the biosorbent surface consists of many strong and active groups of negative valences such as hydroxyl and carboxyl groups, thus exhibiting several morphological properties of interest. Further, it was found that the Temkin model best fitted the isotherm biosorption data. The kinetic study showed that the Ni(II) biosorption was rapid within first 20 min of reaction time, thereby following a pseudo-second-order model, which in turn demonstrated a chemisorption process of Ni(II) ions reaction with the biosorbent binding sites. Also, the thermodynamic study suggested that the biosorption process of Ni(II) onto algal biomass was a spontaneous and endothermic in nature. The maximum uptake of Ni(II) was 9.848 mg/g under optimized conditions and neutral environment. Thus, this significant finding suggested a favorable and eco-friendly treatment mechanism for removal of Ni(II) ions from aqueous medium via biosorption onto the used mixture of nonliving algal biomass. Authors express their thank to the University of Baghdad (Baghdad, Iraq) and Isra University (Amman, Jordan) for their support during this study.